Congrats to NASCAR driver and Back2Back supporter, Trevor Bayne on winning the Daytona 500 on Sunday, the youngest driver ever to win the sports’ biggest race! 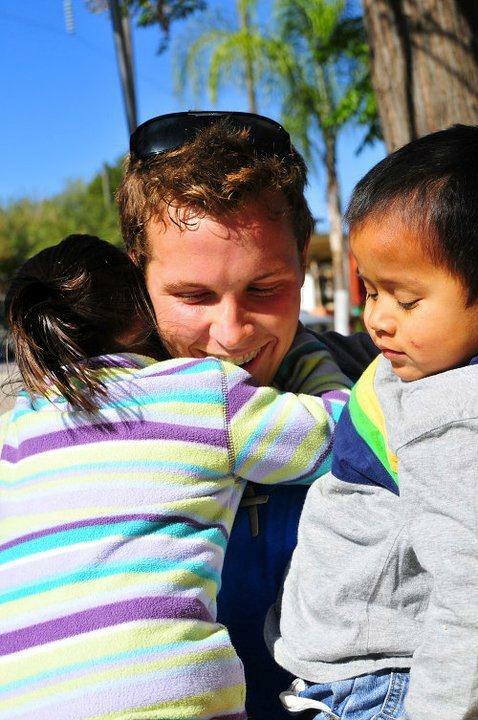 Bayne has served with Back2Back in Monterrey, Mexico and pledged to donate portions of his Daytona 500 prize money to Back2Back’s orphan care work in Mexico. Thanks for your support Trevor! I met Trevor Bayne while serving as the lead chaplain to the NASCAR Nationwide Series with Motor Racing Outreach (MRO). I started a small group Bible study at the race track and we met every Saturday before the race. Trevor, Michael McDowell, Justin Allgaier and Ricky Stenhouse Jr. were the nucleus of our study. Trevor was also faithful to attend our weekly MRO chapel services. It was evident from the moment that I met Trevor that he was a young man that was not ashamed of his walk with Jesus Christ. I would occasionally have him read the Scripture at the start of our chapel services or open in prayer. Trevor was bound and determined to share the story of Christ’s love any chance he had the opportunity. He would take advantage of every speaking opportunity that was offered to him and he also wore a cross around his neck and even a big belt buckle with a cross on it. He would also flood his Facebook and Twitter with Bible verses that the Lord was using in his life at the time. God put a passion in my heart to leave MRO and come serve alongside of Back2Back in helping provide “care for today and hope for tomorrow” for the orphan. God used the book by Crazy Love by Francis Chan to help nudge me in that direction. That also happened to be the book that we used for our weekly Bible study small group. Well, none other than Francis Chan showed up at the race and Francis even concluded our chapel service in prayer and hung out with the Bible study group before the race started. Trevor had a blast hanging out with Francis. Francis even joined me in prayer at Trevor’s car before the start of the race. 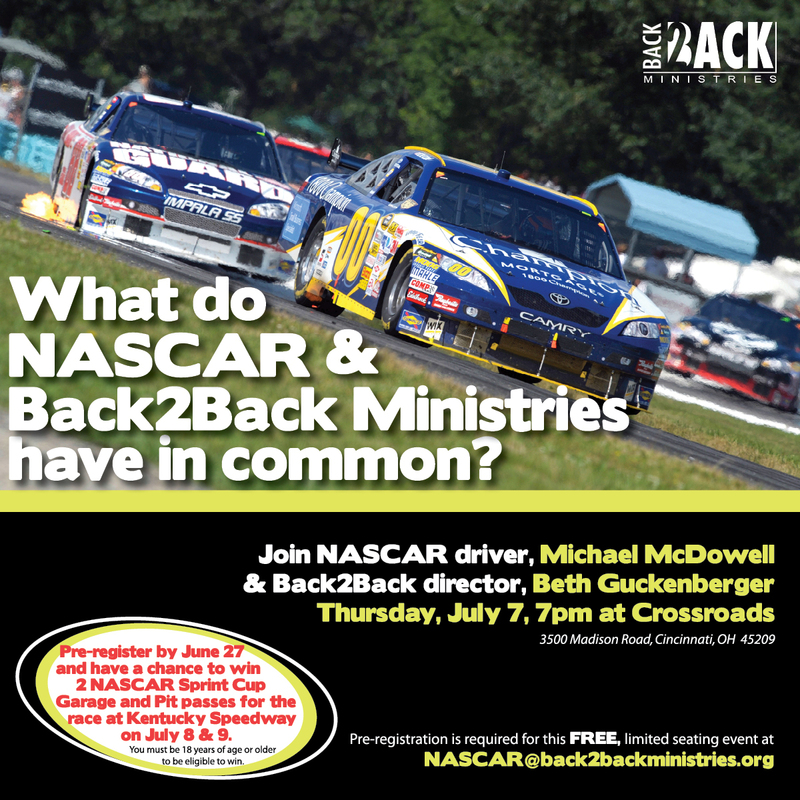 Michael McDowell is a strong follower of Christ and God has really used him as a leader in the lives of the younger drivers in the Nationwide Series. Michael and Jami McDowell are powerful advocates for the orphan in the sport of NASCAR and they are currently adopting a young child from the country of Ethiopia. Michael called me to ask if he could come to Monterrey to see the ministry of Back2Back firsthand. Michael talked Trevor into coming alongside of him for their week of service in Monterrey and Trevor fell in love with Back2Back and the orphans of Monterrey. Trevor was not afraid to get his hands dirty. He worked on several construction projects such as fixing a broken gas line at one of the children’s homes (orphanages) and he also played soccer and loved on the orphans. We showed up at one orphanage and the pantry was empty. We drove down to the local grocery store with the caregiver and Trevor purchased an abundance of food for the kids. Trevor’s face was beaming the whole time that we were in store and there was no doubt that was working in Trevor and also using him in the lives of these kids. Trevor and Michael spoke about being racecar drivers for a few minutes to the kids and they signed hordes of their autograph cards for the children and adults. 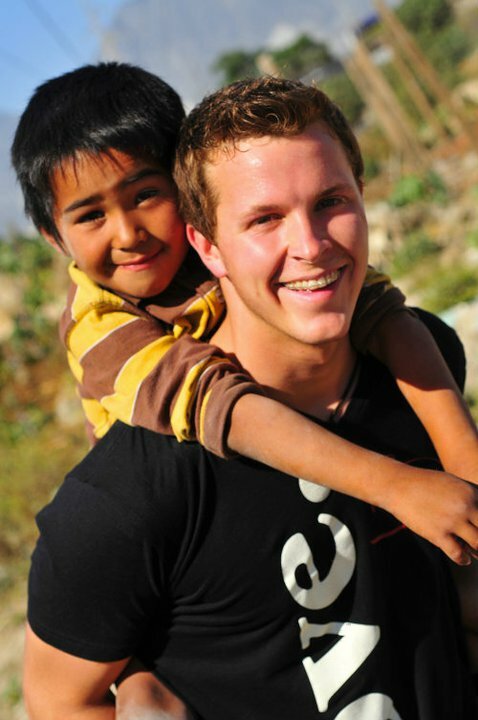 At the conclusion of the trip to Monterrey, Trevor asked me when he could return to help serve the orphan. I mentioned that he had an open invitation and he was welcome anytime! Since then I have stayed in contact with Trevor and he has written a foreword for the Back2Back director, Beth Guckenberger’s new book (Relentless Hope, Standard Publishing) that will be released in April. Two days before the Daytona 500 Trevor texted me to ask me to pray that he would be able to handle the highs and lows of the sport. Little did he know that his name would be written in the history books forever when he won the Daytona 500 on Sunday February 20th. At the completion of the race I listened attentively to Trevor’s post race interview in Victory Lane. Trevor did not take any credit but, instead he used the platform that God had given him to share about his love for Christ and passion for the orphan. As his former chaplain it did my heart well to hear him sum up Gods two greatest commands on the biggest stage of his life with millions of people watching: love God and love others! Trevor took a moment to call me after his win from the media center in Daytona. I had the privilege to pray with him and he in tears recognized that his win was not about himself but all about Jesus Christ! To God be the glory. 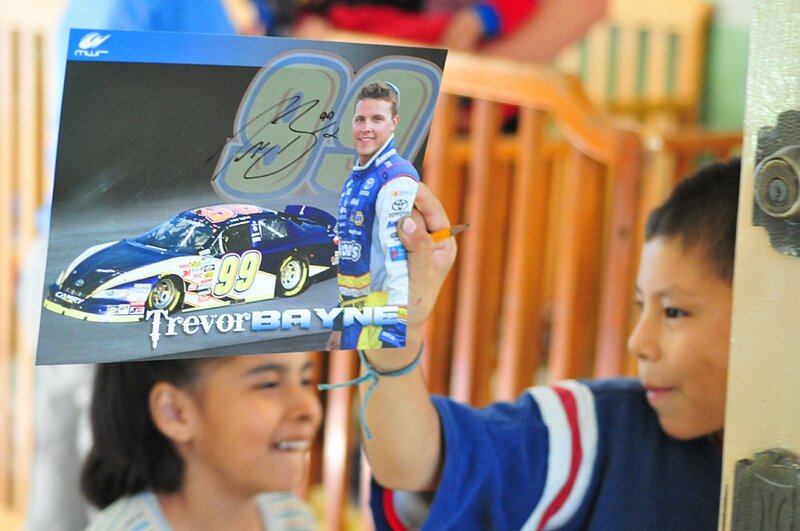 You can follow Trevor on facebook at Trevor Bayne Racing or on twitter at tbayne99. See more photos from Trevor’s trip at http://www.facebook.com/album.phpid=601144530&aid=249328 (photo credit: Joel Kilby).